The sweltering summer of 2017 has a silver lining. When the temperature rises above 104, brown marmorated stink bug population growth is significantly slowed, reported Debbie Arrington in the Sacramento Bee. An invasive pest from Asia, brown marmorated stink bugs showed up in midtown Sacramento in 2013. Their spread to commercial crops has been a concern. The stink bugs feed on dozens of California crops, including apples, pears, cherries, peaches, melons, corn, tomatoes, berries and grapes, said Chuck Ingels, UC Cooperative Extension advisor in Sacramento County. Feeding on fruit creates pock marks and distortions that make the fruit unmarketable. In grapes, berries collapse and rot increases. In 2014 and 2015, the bugs' numbers continued to rise. In early 2016, Ingels feared a population explosion, but a heat wave in July, with seven days at 100 degrees or higher, plus two days at 104, wiped them out. “This year, BMSB started off at historic lows (since 2013),” Ingels said. “Then, the June heat wave hit and the population that was there plummeted. Most of our trap counts for the last few weeks have been at or near zero, whereas there's usually a peak in June. So, it seems to be proof that temperatures over 100 for extended periods reduces the population – probably especially eggs and nymphs." Ingels and UC Davis entomologists are studying the connection between high heat and stink bugs in the lab, where the pest is exposed to extreme temperatures. One hour at 113 degrees killed all the bugs, but mortality was also high over 104 degrees. 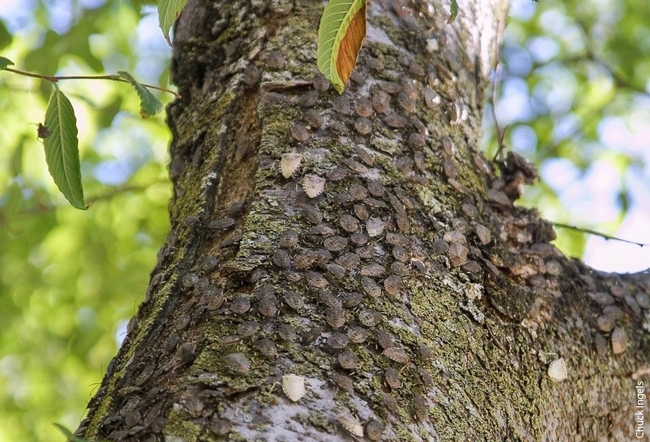 Brown marmorated stink bugs aggregate on a midtown Sacramento tree.